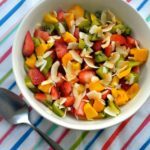 I don’t think there is a better way to start your summer than enjoying this Perfect Rainbow Summer Fruit Salad Recipe. Fresh ingredients, summer fruits, coconut, and lots of goodness for you and your family. I actually love having a fruit salad for a snack or a healthy dessert all year long. Fruits are natural and delicious treats. Easy, delicious and healthy, like only the best salads are. Making a perfect rainbow summer fruit salad recipe is really a great idea if you want to stay healthy. Lots of fresh fruit, a little honey or maple syrup (*optional), and some toasted coconut flakes for a little crunchy touch. Oh my goodness! It tastes like summer to me. 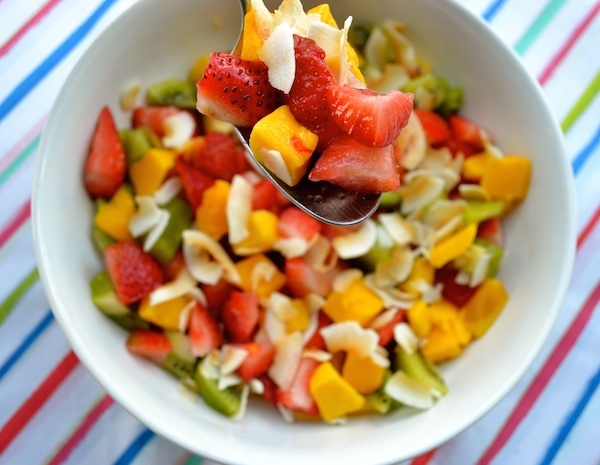 This perfect rainbow summer fruit salad recipe can be made with your favorite fruits. I incorporated different colors to give it a very appealing rainbow look. Kiwis, strawberries, and mangoes, all perfect and colorful summer fruits in my opinion. please see Top 10 Reasons Why You Need To Eat Fruit and start making fruit salads. I am telling you this fruit salad is so amazing. Just look at all the colors and fresh look. Take it to the beach, the park, the swimming pool, or anywhere you like. If you would like more fun summer recipe ideas please see my Natural 3 Ingredient Strawberry Sorbet or Mixed Berries Ice Pops. You can enjoy this perfect rainbow summer fruit salad recipe at home or make a big bowl and serve it at a party. I am thinking it will also be perfect for a BBQ. I am sure your guests will absolutely love it. The maple syrup and toasted coconut flakes gave my recipe a fresh summer taste that is so amazing, I can’t even describe it with words. I also squeezed an orange as a natural dressing and mixed it with a tablespoon of maple syrup. Real fruit, real fruit dressing: pure goodness and all natural. You can store it in the fridge and enjoy it very very cold. Healthy meets simple, fresh, colorful, saucy, and tasty. This is how I describe my Perfect Rainbow Summer Fruit Salad Recipe. It is so easy to prepare you have to give it try. Use your favorite fruits and enjoy a delicious summer treat. Remember to stay away from processed foods and make your own recipes using fresh ingredients always. Delicious and healthy summer fruit salad recipe. Easy to make and simply amazing. Wash, clean and cut the fruit in bite size pieces except for the orange. Place the fruit in a bowl. In a small cup squeeze the juice of the orange and mix with one tablespoon of maple syrup or honey. This is optional if you prefer your salad on the sweet side. 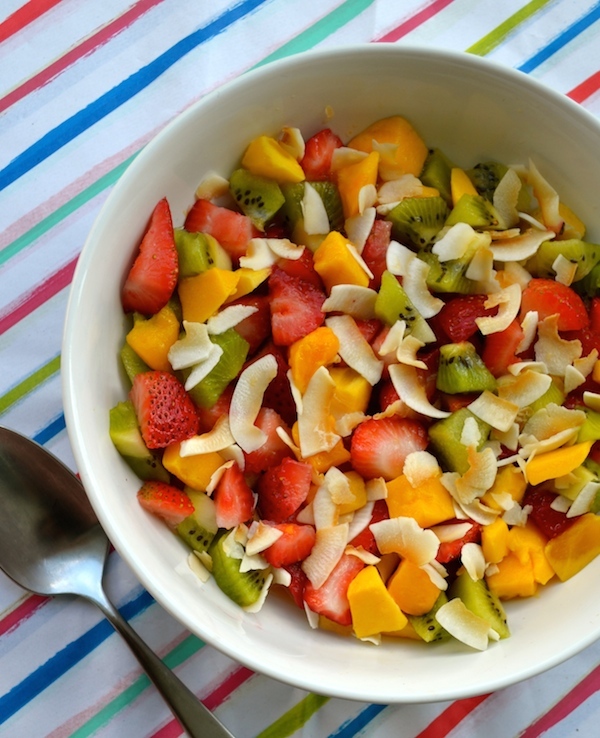 Mix all the fruit with the orange dressing and sprinkle the toasted coconut flakes on top. Enjoy a perfect rainbow delicious summer salad recipe. 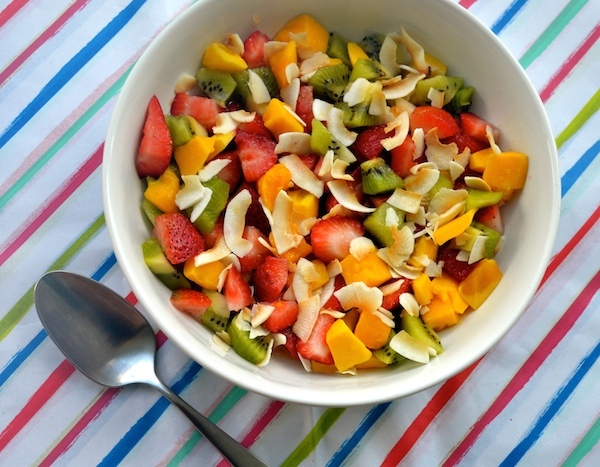 This Perfect Rainbow Summer Fruit Salad Recipe contains affiliate links. The products linked are the products I use and recommend. If you purchase a product through an affiliate link, your cost will be the same but Creative Healthy Family will automatically receive a small commission. Your support is greatly appreciated.